The 25th Congress of the Union of Communist Parties – Communist Party of the Soviet Union (UCP-CPCU) took place in the city of Minsk (the Republic of Belarus) on November 1, 2014. The 25th Congress was attended by 119 delegates from 17 Communist Parties that form the UCP-CPSU. The political report was delivered by the Chairman of the Central Committee of the UCP-CPSU Gennady Zyuganov. The report of the Central Control and Auditing Commission of the UCP-CPSU to the Congress was presented by A.V.Svirid. The first organization plenum of the Central Council of the UCP-CPSU unanimously reelected Gennady Zyuganov as Chairman of the CC UCP-CPSU. It formed the Secretariat and the Political Executive Committee of the Union of the Communist Parties. Having heard and discussed the Political Report of the Central Council of the UCP-CPSU, the XXXV Congress of the Union of Communist Parties – Communist Party of the Soviet Union notes that in the period in between Congresses the situation in the world has deteriorated dramatically. The main threat to the present and future of humankind comes not from deadly epidemics, not from religious terrorism and extremism, but from the bankrupt but still predominant system of capitalism which constantly reproduces economic crises, military brigandage, glaring poverty and barbarous destruction of the environment. The situation in the world in recent years has been marked by a severe financial and economic crisis which has rocked the very foundations of the capitalist world order. According to the World Bank, “the storm is only approaching”. Not surprisingly the world financial oligarchy habitually tries to shift its insoluble problems on the population of Asia, Africa and Latin America. The Commonwealth of Independent States countries to occupy a special place in the plans of the “managed chaos” strategists. The Cold War waged by the American imperialism and its underlings at the aggressive NATO bloc against our common Motherland, the Soviet Union, conducted inside the country with active assistance of the “fifth column,” ended in 1991 with the destruction of the historical united multinational power which broke up into “independent” territories, the severance of economic, cultural and kinship ties among its peoples. Yet the new “masters of the world” are unhappy even with such “truncated” sovereignty of the former union republics. Their aim is to throw our peoples back into medieval savagery, to turn the space of the former USSR into a field of interminable bloody internecine feuds. For more than 20 years global imperialist reactionaries have been ruthlessly and relentlessly pursuing the policy of undermining the national statehood of divided Soviet peoples, promoting neo-nazi and fascist trends, brazen manipulation of public consciousness and fomenting ethnic and religious strife. These processes have manifested themselves in Georgia, Latvia, Lithuania, Moldavia and Estonia. However, at present the most explosive are the attempts to ruin the Russian state, to destabilize the social and political situation in the country, to dismember its territory and to plunder its riches. A ferocious onslaught on Russia and its friendly countries in the post-Soviet space has been launched on Ukrainian territory. In February 2014 the Ukrainian Nazis, generously financed by the US special services, perpetrated a military coup in the republic and provoked a fratricidal civil war. The results of the pro-fascist putsch have been sealed by pseudo-democratic presidential and parliamentary elections that took place in an atmosphere of chauvinist frenzy and anti-communist hysteria, and physical suppression of the political opponents of the ruling clique. In spite of the temporary successes of the Western puppeteers in the dirty business of separating fraternal peoples, the yearning for a revival, in one form or another, of our common union state is still in the hearts of millions of Soviet people. Besides, urgent economic needs are relentlessly making themselves felt. Through the efforts of the leaders of Belarus, Kazakhstan and Russia the Eurasian Economic Union has been created which has since been joined by Armenia. Kyrgyzstan will shortly join this international economic alliance, the largest in the world in terms of territory. The most consistent political force that constantly struggles for voluntary integration is the Union of Communist Parties into which the Communist Party of the Soviet Union was transformed temporarily in 1993 pending the recreation of a renewed Union of Soviet Socialist Republics. During the period since the previous XXXIV Congress the Central Council, the Political Executive Committee and the Secretariat of the CC UCP-CPSU have carried out a certain amount of work to unite the Communist movements of the CIS countries as well as the Baltic states, Georgia and Ukraine. The UCP-CPSU today comprises 17 fraternal parties with a total membership of more than 300,000. Among the milestones in the life of our Union were the holding in the summer of 2011 of an International Forum “Unity: the Path to the Salvation of the Fraternal Peoples” and the February 2012 declaration that confirmed allegiance to the principles of The Treaty on the Formation of the Union of Soviet Socialist Republics. International solidarity of the parties in counteracting imperialist aggression and the growing threat of fascism has grown stronger. The constant use of the institution of international observers during election campaigns has emerged as an effective mechanism of mutual help. The members of the Central Council of the UCP-CPSU led by its chairman, Gennady Zyuganov, have made a tangible contribution to the struggle of Abkhazia, Trans-Dniestria and South Ossetia for the freedom and independence, to the recognition of their sovereignty and the self-determination of their peoples. Ahead lies a long, arduous and large-scale work whose result would depend entirely on our ideological staunchness and organizational cohesion. To qualify the work of the Central Council of the Union of Communist Parties-Communist Party of the Soviet Union as satisfactory. To support the assessments and conclusions contained in the Political Report of the Central Council of the UCP-CPSU to the Congress, and to be guided by them in the day-to-day practical activities of the Communist Parties-members of the Union. To approve the Resolution of the 35th Congress of the UCP-CPSU “Carry on the Cause of the Great October”. To regard as priority strategic tasks of the fraternal communist parties under the current dangerously complicated conditions the unification of all the strata of the working people for an early exit from the global crisis, for overcoming its destructive consequences; counteraction to the fascization of social life and the revival of the socialist social system. Working towards these goals it is necessary to flexibly combine the methods of parliamentary and non-parliamentary struggle. To persistently and constantly conduct the propaganda of Marxist-Leninist ideology, the principles of proletarian internationalism, to promptly rebuff nationalist actions and any attempts to sow the seeds of hatred and mistrust among the peoples. To initiate the creation of public committees to protect the monuments to V.I. Lenin, memorials to Soviet Liberator Soldiers, other monuments and symbols connected with revolutionary, military and labor achievements of the Soviet people. The Congress believes that a key task is to strengthen the role of the Union of Communist Parties in organizing research into topical problems of the theory and practice of the struggle for socialism, the historical experience of implementing the ideas of the Great October Revolution. To recommend to the Central Council of the UCP-CPSU, jointly with the governing bodies of the Communist Parties within the Union, to consider the issue of creating, for the above purpose, a Scientific-Methodological Center under the Political-Executive Committee of the CC UCP-CPSU. To strengthen the mass consciousness of historically belonging to a single motherland, respect for all the nations, large and small, of the former Soviet Union, it is necessary to continue the tradition of holding the congresses of the peoples of the Union State of Belarus and Russia, the peoples of the Caucasus and of the Central Asian region. Along with protecting their national languages, to render every support to the Russian language as the vehicle of international communication, mutual enrichment of cultures and exposure to the achievements of world civilization. To build up a campaign of solidarity with the fraternal parties suffering repressions on the part of the ruling regimes, above all, the Communist Party of Ukraine and the United Communist Party of Georgia. To give wide publicity and to condemn every fact of the persecution of communists and their supporters for their political convictions. To us the entire arsenal of political and legal means to secure an early release of our comrades languishing in jails. To pay serious attention to organizational strengthening of the party ranks. To focus on the tasks of attracting to the fraternal parties new forces from amongst workers, farmers, women and youth. To improve the system of party studies and personnel training. To expand the circle of allies of the UCP-CPSU, to cooperate more actively with the trade unions, military-patriotic, veterinary, women’s and youth organizations whose activities do not contradict the idea of reviving on a voluntary basis a union of equal and sovereign states of fraternal peoples. To promote the unification of the intelligentsia, workers in science and education for the sake of saving national cultures. Considering the importance of close interaction with the communist and workers’ parties, other left-wing forces on the planet, of looking for common ground with a wide spectrum of world and regional non-governmental organizations, to develop the international ties of the Union of Communist Parties. The Congress reaffirms the course of the UCP-CPSU for the unification of all the forces coming out for freedom and democracy, for peace and social progress. To instruct the new Central Council of the UCP-CPSU, within three months, to develop practical measures to fulfill the Congress decisions as well as to put into practice the proposals and critical remarks made by the delegates. The centenary of the Great October Socialist Revolution is approaching. Our revolution is the most outstanding political event of the 20th century that marked a breakthrough of humanity toward the future unheard-of in history. The Great October Revolution is at once a peculiarly Russian and an international phenomenon. The Russian Revolution was bound to happen because by 1917 the country was a tangle of antagonisms that reflected the specific features of its historical development. Russia had to resolve acute contradictions between the production forces that needed room for development and the vice of production relations of the semi-feudal type, between the monarchy superstructure and the social and political needs of the Russian capitalism which had achieved a middle level of development, between the interests of the center and the national borderlands. The Revolution pitted against each other the union of the working class and peasantry and the union of land owners and capitalists. The victory of the Great October Socialist Revolution became possible due to the aggravation of the numerous contradictions in the context of the First World War. The Revolution was also a global phenomenon because the main contradiction between the production forces and production relations was crying for resolution on the scale of the whole planet. The victory of the Great October Revolution marked the start of the development of a social system in which for the first time in centuries-old history, the exploitation of man by man was overcome. The guiding star for the social creativity of the working masses, notably the Russian working class, was the scientific Marxist-Leninist theory of socialist development. Expropriation of big private property was a forced reaction of the proletariat to the massive sabotage by factory owners. At the same time this objective process marked a stage in implementing the transition from the omnipotence of private property to establishing socialist relations scientifically validated by Karl Marx and Friedrich Engels. The nationalized enterprises became the property of the whole people. The state performed only managerial functions with regard to them. The Great October Socialist Revolution turned the Soviets, the result of the revolutionary creativity of the masses, into the most effective form of state power. This formed the foundation of genuine rule of the people. It combined direct democracy of the workers at factories, mines, in farming and forestry and the representative democracy of a new type that did not envisage the separation of the legislative and executive branches. The Soviet power born of the Great October Revolution represented a unique unity of the largest social organization of the working people and a new type of state. The guarantee of the victory of the Great October Revolution of 1917 was the formation of a new type of the political vanguard: the Russian working class resolutely supported the strand of revolutionary Marxism formed under the leadership of Vladimir Ilyich Lenin which went down in history as Bolshevism. It is not by chance that Lenin in his work “Left-Wing Communism: Infantile Disorder” stressed the “international significance (in the narrow sense of the word) of Soviet power as well as the foundations of the Bolshevik theory and practice”. Bolshevism combined the methodology of revolutionary Marxism, the organizational principles of a new type of party that envisaged united action of its ranks and the solid support of the working class as its inherent social base. The victory of the Great October Socialist Revolution initiated a reliable alliance of all the social classes that lived by their work on the basis of the proletarian dictatorship. The key feature of the proletarian revolution was its incompatibility with opportunism which in practice is always an instrument for smuggling bourgeois ideology and politics into the activities of communist parties, the workers’ movement, into the consciousness of millions of working people. The Great October Socialist Revolution was logically developed through the heroic victory of the union of workers and peasants over internal counterrevolution and foreign military intervention in the Civil War unleashed by Russian and world capital. That victory created prerequisites for fruitful peaceful socialist construction during the rehabilitation period and in the years of the heroic pre-war Five-Year plans. During the decade of the 1930s Soviet society, led by the Communist Party, accomplished what it took the leading capitalist economies of the world 50-100 years to accomplish. Socialist industrialization, collectivization and the cultural revolution were successfully implemented. The USSR became a leading country in terms of economic and cultural development. The Great Patriotic War of the Soviet people against German fascism and Japanese militarism was the greatest test of the viability of the ideals of the proletarian revolution and the adherence of the multimillion multinational Soviet people to the historical route chosen in October 1917. The red flag over the Reichstag in May 1945 became an eternal symbol of the unity of the revolutionary generation of the fathers and the war generation of the sons. Looking back, we can say following Iosif Vissarionovich Stalin, that the viability of Soviet socialism and the Soviet state system was also confirmed by the successes of our people in post-war socialist reconstruction. The Great October Revolution manifested itself in the conquest of outer space, the creation of powerful territorial-production complexes on the Volga and Ob rivers in Central and Eastern Siberia, radical economic and cultural transformations in all the Union republics. It is not the fault of the Great October Socialist Revolution that its ideals and their implementation sometimes diverged from the realities of Soviet society. The lag in the economic competition with the world capitalist system, downgrading of ideological and theoretical work and political education of the masses, the violation of Leninist norms of party life on the one hand led, in the 1970s-1980s to the dilution of the class basis of the ruling communist party and on the other hand, enabled cynical career-seekers and turncoats to occupy the top posts. The consequences of their destructive activities were a massive retreat of socialism, bourgeois counterrevolution and restoration of capitalism on the territory of the USSR and the East European countries. However, the class struggle for implementing the Communist ideas continues, as witnessed by the determined preservation of the key elements of the socialist way of life in the Republic of Belarus and the dream of the majority of Russians about the revival of a society which basically incorporates the achievements of Soviet socialism, and by the fierce resistance to the Nazi followers in South Eastern Ukraine. Pointing in the same direction is the inability of the capitalist world to maintain the classical bourgeois democracy in the context of the crisis and the fact that it is falling back on fascist methods. Expressing the will and political position of its member communist parties the 35th Congress of the UCP-CPSU reaffirms the validity of the essential assessments of the Great October Socialist Revolution given by Marx and Leninism. We reaffirm our steadfast adherence to them. The Union of Communist Parties-CPSU is not only an heir to the ideals of the Great October, but it continues its revolutionary cause. Socialism and the rule of the people are the main mottoes of our international communist organization. Proceeding from the Marxist-Leninist interpretation of the Great October Socialist Revolution and on the need to resolutely struggle for further implementation of its great ideals, the 35th Congress of the UCP CPSU recommends the Communist Parties that are members of the Union to develop and implement a range of measures devoted to the centenary of the Great October Socialist Revolution. 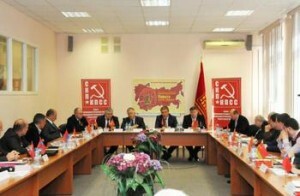 To recommend to the Communist Parties, members of the UCP-CPSU to hold, following the example of the CPRF, the plenary sessions of their central governing bodies to analyze the state of the working class in their countries and strengthen the influence of the communist parties on the proletarian milieu. To instruct the Central Council of the UCP-CPSU to develop a program of solidarity actions aimed at protecting the interests of the class of hired and exploited workers. To recommend to the new Political Executive Committee of the Central Council of the UCP-CPSU to hold, jointly with the CC CPRF, a jubilee international scientific conference in 2017 devoted to the significance of the Great October Socialist Revolution for the modern struggle of the working class and all the working people for socialism. During the course of preparation for the centenary of the Great October Socialist Revolution the political Executive Committee of the CC UCP-CPSU jointly with the Central Committee of the Trans-Dniestria Communist Party may hold in 2015 an international scientific conference “Internationalism: General Laws and National Features of Class Struggle”. Jointly with the Central Committee of the Communist Party of Belarus, a Scientific Practical Conference called “The Working Class and the Trade Unions in the Struggle Against Capitalism” may be held in 2016. The theoretical journal Izvestia SKP-KPSS (chief editor Kostina M.B.) shall introduce since 2015 special sections devoted to the centenary of the Great October Socialist Revolution. The editors of the monthly page of Vestnik SKP-KPSS in the newspaper Pravda (V.V.Trushkov, I.N.Makarov) shall introduce a rubric devoted to the upcoming jubilee of the Great October Revolution. May 9, 2015 will mark the 70th anniversary of the Victory of the Union of Soviet Socialist Republics in the Great Patriotic War against fascist Germany and its satellites. The courage of the Soviet soldier, the unexampled fortitude of the common worker, the state and military genius of Stalin have saved humanity from the deadly Brown Plague. The key source of the Great Victory was the monolithic unity of the multinational Soviet people forged in battle and in peaceful work under the leadership of the All-Union Communist Party (Bolsheviks). Among the Heroes of the Soviet Union in the battles of that truly national war were 8 182 Russians, 2 072 Ukrainians, 311 Byelorussians, 96 Kazakhs, 91 Georgians, 90 Armenians, 69 Uzbeks, 43 Azeris, 34 Ossetians, 19 Moldavians, 18 Turkmenians, 15 Lithuanians, 14 Tajiks, 13 Latvians, 12 Kirgizians, 9 Estonians and 5 Abkhazians. May 1945, which was a logical continuation of the history-making October 1917, crowned the world historic achievements of socialism. It demonstrated the strength and viability of the new social system, greatly enhanced the authority of the Soviet power among the peoples of the planet and triggered revolutionary change on all the continents. It was during the Victory Spring that international organizations of trade unions, women and youth who wrote the slogans of peace, freedom, democracy and social progress on their banners were born. Anti-fascist resistance of millions of communists and patriots developed into socialist revolutions in a number of countries in Eastern Europe, South-East Asia and on Cuba. Under the onslaught of the national liberation struggle of the oppressed nations the colonial system of imperialism in Africa collapsed. The victory of the Soviet people over fascism dramatically changed the balance of forces on the international arena. After the formation of the socialist commonwealth a stable balance was established between the world social systems of socialism and imperialism, a military political balance on the globe that ensured peaceful life for half a century. However, no sooner did the trenches of the Second World War overgrow with grass than imperialist reaction, led by the US ruling elite, declared another “crusade” to the East. The Cold War against the socialist countries, the criminal ruining of the USSR threw humanity back into the past, creating a real danger of a new world slaughterhouse that is growing year in and year out. The unprecedented global financial and economic crisis is a catalyst of a future catastrophe. The looming calamities can still be prevented by uniting, like 70 years ago, all the progressive anti-fascist democratic national liberation forces throughout the world. It is the duty of each of the fraternal parties within the UCP-CPSU to make its contribution to the struggle against resurgent fascism, to defending the gains of the Great Victory. We will not allow anyone to rewrite our common history, to pervert facts, to desecrate our common symbols and monuments and to whitewash nazi butchers and their accomplices. We will not allow financial tycoons, who had brought forth Hitler in their time, to set our peoples against one another in bloody fratricidal confrontation. Together we will organize commemorative actions in all the former republics of the Soviet Union without exception. We will recall again and again and immortalize the sacred names of those who died a hero’s death defending the multinational motherland, those who have been burned alive and tortured to death by the fascist beasts. We bow our heads to the veterans, the surviving authors of the immortal feat. We will bring the light and life-giving force of our Victory to the youth and help it to learn the truth and acquire confidence in tomorrow. 69 years ago our fathers and grandfathers – members of the single multinational family of Soviet peoples – scored a victory in the Great Patriotic War. At the time, in 1945, it seemed that the defeated “brown” monster would never again spread its lethal tentacles and that the long-suffering Earth would never be sprinkled with human blood and tears. Fascism was exposed and condemned by the Nuremberg Trial as the greatest crime against humanity, but it was never annihilated. Throughout the post-war decades the very fact of the existence of the Soviet Union was a solid guarantee that the Nazi followers would never dare rear their heads. The destruction of the world’s first socialist country opened up great scope to out-and-out pogromists and scum. The Glory Memorial blown up by Saakashvili people in the Georgian city of Kutaisi, many years of desecration of the monument to General Chernyakhovsky in the Polish city of Pienieznie, the disgraceful witches’ Sabbath around the Bronze Soldier in Tallinn, the marches of the descendants of Bandera in Lvov, Kiev and other Ukrainian cities; the parades of former nazi butchers in Vilnius and Kishinev, the sophisticated harassment of the Latvian security of the legendary partisan Vasily Kononov, the burning of books of progressive political figures and outstanding writers all attest that the slippery path of anti-communism and anti-Sovietism inevitably leads to fascism. Until very recently it was thought that literal reproduction of fascist methods of the 1920s-30s was simply impossible. The current bloody events in Ukraine have shattered those illusions. Oligarchic capital is again looking for a way out of the protracted global crisis in fascism and a new world war. The political adventurers who are reanimating fascism are not aware of the consequences of their crazy actions. The tragic history of the past century has not taught them anything. The predecessors of Cameron, Hollande, Merkel – all these Chamberlains, Daladiers and Papins – in their time tried to flirt with the Hitlerites. These games cost our planet more than 72 million human lives. Now that the world has again found itself on the brink, there is no other political force than the international army of communists that is capable of organizing and leading the resistance to fascism’s brazen aggression. The XXXV Congress of the Union of Communist Parties – the Communist Party of the Soviet Union again appeals to the anti-fascist and democratic forces of Europe and of the whole world calling it to stop the new aggression of fascism, launch a massive movement against the fascist threat, create a powerful antifascist and anti-imperialist front. PUT THE FASCISTS IN THE DOCK! In the eyes of the whole world the greatest tragedy is unfolding: the territorial disintegration and fratricidal war in Ukraine. What is taking place in what was only yesterday a prosperous republic is directed not only against the Ukrainian and Russian peoples but at the whole Slavic world. The Trans-Atlantic “strategists” believe that Ukraine should act as a fuse that would set off a monstrous bomb capable of blowing up the entire Eurasian space, wiping away whatever remains of the post-Soviet statehood and plunge millions of citizens into bloody chaos. In order to implement these cannibalistic goals, the USA and its accomplices in NATO brought to power in Kiev a pro-fascist, pro-Bandera clique. It is as if the former allies of the USSR in the fight against Hitler have suddenly lost historical memory. They appear to have “forgotten” that during the Second World War the Banderovites were a docile and unthinking weapon of the German fascist enslavers. The Hitlerites used this riff-raff to perpetrate the most heinous crimes whose sinister symbols are the Byelorussian Khatyn that had been burned to ashes and the Volyn tragedy. Hundreds of thousands of Ukrainians, Russians, Jews, Poles and people of many other nationalities died at the hands of these butchers. In peace time the Bandera movement turned out to be not a national liberation movement but a sect of crazy fanatics whom the special services of Western “democracies” have taken under their wings. After the collapse of the Soviet Union the new Ukrainian “elite” used the poisoned ideological weapon of Nazism not only to dupe and intimidate the voters, but to protect the ill-gotten property of the oligarchs. But the followers of Bandera are not the whole Ukraine. It will never come to pass that the great nation of Bohdan Khmelnitsky and Grigory Skovoroda, Nikolai Gogol and Taras Shevchenko, Ivan Kozhedub and Sidor Kovpak, Vasily Sukhomlinsky and Boris Paton would resign itself to the disgraceful role of a factory of “cannon fodder” for the criminal adventures of foreign and homebred moneybags. Everywhere in the country the grapes of popular wrath are ripening. Ordinary working people – true patriots of Ukraine – are rising to defend their right to live peacefully on their land, to speak their native tongue, to commemorate the feats of their fathers and grandfathers performed during the Hitler invasion. The 35th Congress of the UCP-CPSU expresses its solidarity with those who are resisting the spreading neo-Nazi evil, above all with the embattled Communist Party of Ukraine, which is subjected to brutal repressions and whose members are the targets of constant moral and physical terror. We, the Communists of 17 fraternal parties, believe in the future of the Ukrainian state. The only alternative that can save it is to follow the behest of Vladimir Ilyich Lenin that is etched on the granite pedestal of the outstanding monument destroyed by the angry crowd on Bessarabskaya Square in Kiev: “A free Ukraine is only possible if the proletarians of great Russia and Ukraine act together, without such unity there can be no question of it”. That is why it is our common cause and our common duty to do everything to strengthen the fraternal union with the Ukrainian people at the time of severe trials. This entry was posted in Statements, Uncategorized and tagged UCP-CPCU, Unión de Partidos Comunistas – Partido Comunista de la Unión Soviética, Union of Communist Parties – Communist Party of the Soviet Union, UPC-PCUS on December 9, 2014 by International Department.